Growing up in Hong Kong, Stephanie Wu ‘18 hardly thought about race at all. When she came to the United States to study psychology at Colgate, she was in for a new experience. “My race was suddenly so salient,” Wu said. That profound shift in the way Wu experienced her racial identity has prompted her to research racial perception and prejudice. In the summer of 2016, Wu and research partner Rachel Geyer ’17, working with Professor Erin Cooley in the Department of Psychology, began a project that would examine individuals’ empathetic reactions to people of other races, and the factors that affected those reactions. Previous psychological research has shown that people react more empathetically to people of their own race when they experience pain or other stimuli. Wu and Geyer’s ongoing research examines how other factors known to influence empathy, such as nonverbal mimicry — think of the old job interview trick of mirroring body language — would affect that gap. The researchers show test subjects images of people receiving either a painful or neutral stimulus — their palm poked with either a cotton swab or a needle — and measure physiological responses associated with empathy, as well as the race of the test subject and the person receiving the stimulus. While she learns psychological concepts and theory in her classes, Wu found that, to apply them in her research, she needed to develop and use a wide range of complementary skills, from technical and computing to writing and project management. Wu and her fellow researchers learned to operate the sensors that gauged those responses and to program the computers that recorded the sensors’ output. Wu also wrote scripts for interacting with the research participants, a strategy for reducing the number of variables as much as possible. “We had to learn how to do pretty much everything,” Wu said. Now that Geyer has graduated, Wu leads a mostly new group of research assistants, many of whom she has trained herself. It’s been a lot of work, Wu said, but that research experience will be invaluable for her graduate school and professional prospects. It helps, too, that she has supplemented her research and her own experiences of race with a minor in educational studies, which has allowed her to study its social and sociological influences. Wu said her educational studies classes have further expanded the way she thinks about identity — she sees how identity works as a political and social concept as well as a psychological one. 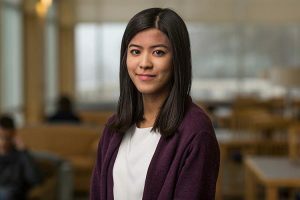 While her research at Colgate has mostly focused on prejudice and empathy between black and white people, Wu hopes to bring her own identity under the microscope in the future. Wu explained that there is a rich spectrum of Asian identities in America spanning race, ethnicity, nation of origin, and level of assimilation, which is equally worthy of research. For her thesis, she plans to work with Cooley to study the perception of “whitewashing” among Asian and Asian-American students — how they perceive the race and level of assimilation of other students based on the groups with whom they associate. She hopes that her research will help bring insight to the nuances of Asian-American identity and give students who face sudden changes in their racial experience, as she did, a way to understand their world.